Oluf Wold-Torne, "Landscape from Holmsbu", 1911. Photo from DigitaltMuseum. 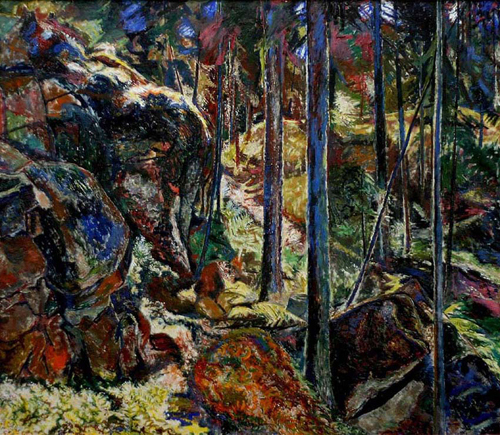 I'll stretch my summer by looking at paintings from Holmsbu in Eastern Norway. The one above was painted by Oluf Wold-Torne in the summer of 1911, the first of many summers when he and other artists came to Holmsbu to work. By blurring out details from the foreground and simplifying the foliage and shrubs, Wold-Torne leads our attention towards the hill and mountains on the other side of the fjord. 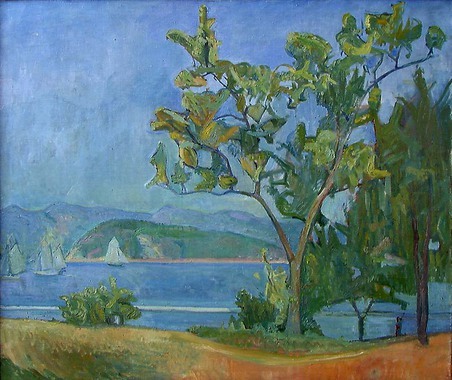 Horizontal lines create a calm sensation, and the central stretch of water is framed by trees on the right and sailboats on the left. A large portion of the painting is blue sky which is hazy enough to render that feeling of summer comfort and reverie that I so much want to hold on to now that fall is approaching. Thorvald Erichsen, "Fra Holmsbu", 1931. Photo from Gwpa. 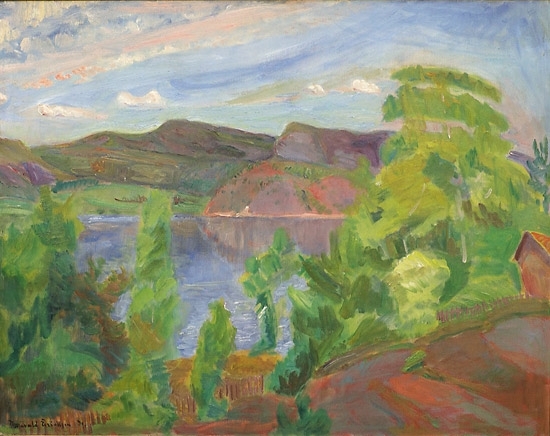 In this painting by Thorvald Erichsen some of the pink rock that is such a characteristic feature of the Holmsbu area, can be seen bathing in the evening light across the fjord. 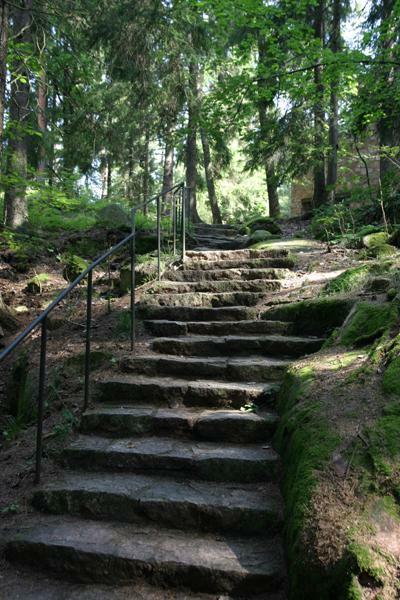 A gallery that houses works by Oluf Wold-Torne, Thorvald Erichsen and Henrik Sørensen (who are considered the three most central Holmsbu Painters) has been built in the woods that stretch inland from the fjord. 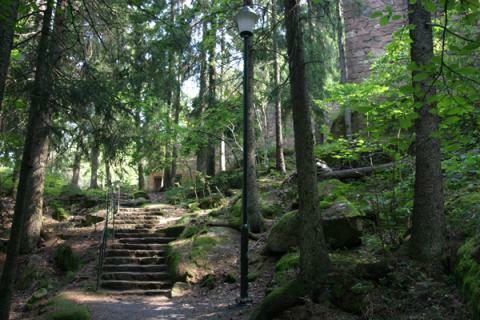 It is clad in the local pink granite, and it lies well camouflaged on top of a steep trail. Holmsbu Billedgalleri, 1963-73, architect: Bjart Mohr. Photo from essential events. 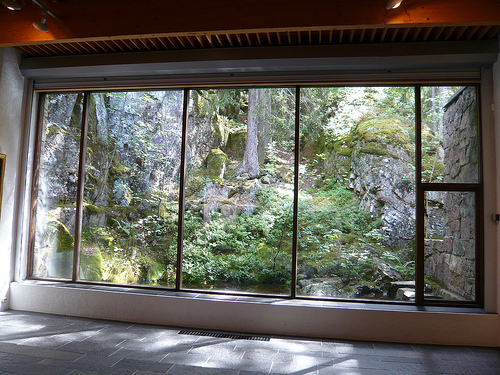 At the back of the building a large window lets the untouched landscape become an important part of the total aesthetic experience that includes architecture, landscape and paintings, among which some depict the same landscape as one can see through the window (like the one below). Henrik Sørensen, "Trollura i Jahrskogen", 1933. Photo from Drammens Museum. Ilya Kabakov, "The Man Who Flew into Space from his Apartment"